Kilimanjaro balloon safari, fly over the Serengeti, next to Kilimanjaro, the summit of Africa. Trips and safaris! Visit the trips page for professional, inexpensive expeditions to Kilimanjaro! All routes as well as affordable safari, everything customized for group prices! NEW: The Serengeti Balloon Safari! Fly over the Serengeti in a hot air balloon. You will fly high over the mighty Serengeti plains, and your professional pilot will lower you regularly to see the wildlife from an angle you have never seen before! To finish it off we will land in the wild plains of the Serengeti, where we will be treated to an authentic Serengeti Breakfast, prepared and served in the wild, while Zebra and Gazelle pass nearby. The flights will fly daily, but need good weather. All flights are at dawn, and the total program takes about 3-4 hours, of which one hour actual flight. It can be combined with any other Safari program with at least one day in the Serengeti. 5:00 am, Serengeti Balloon Safaris will collect you from your central Serengeti lodge or camp, and transfer you by Landrover to our launch site near Maasai Kopjes. Here you will meet your pilot, receive a briefing and watch the inflation of your balloon. At other times he will ascend to 1000' or more to see the enormity and wonderful panorama of the Serengeti. From time to time the pilot must put more heat into the balloon with the powerful whisper burners. In between these burns, there is silence apart from the natural sounds below. The flight is for about one hour depending on conditions, on landing you celebrate in the traditional manner with champagne (well, an excellent sparkling wine), before sitting down to a full English breakfast prepared and served in the bush in 'Out of Africa' style with bone china, linen table cloths, King's silver etc. After breakfast you receive your Serengeti Balloon certificate and we drive you back to Seronera Lodge game viewing enroute. 9:30 am Arrive at Seronera ready to continue your day's activities. Imagine sitting at a table under the shade of a classic umbrella tree on the Serengeti Plains. The table is laid with bone china and King’s silver cutlery. Fresh tropical fruits, warm freshly baked bread and English traditional breakfast of bacon, sausage, eggs, mushroom, tomato are all served by stewards in customary Swahili dress. In the distance the heat shimmers. Superb starlings chatter in the nearby tree. In ironic role reversal, it’s now the animals, keeping at a safe distance, that are watching you eat! You sigh and think, yes “I could get accustomed to this”. RACK RATE: US$ 479 per person inclusive (15/12/07 to 15/12/08, after that it's $499). This is additional to your regular safari costs for that day. SERVICE: Daily throughout the year. FROM: Serengeti Seronera area. INCLUDES: pick up from lodge, tented lodge or campsite, inflating of balloon, 1 hour flight, landing in Serengeti with celebration drink, breakfast prepared and served in the Serengeti (outside), certificate, transfer back to (tented) lodge or campsite. I am on an organised safari with a set itinerary. Can I do this? Yes, providing you are staying the night before the balloon safari at any of the central Serengeti lodges (Seronera, Serena or Sopa Lodge) or central campsites. We collect you before the flight and return you to Seronera Lodge at 9.30am to join the rest of your party & continue your day's activities. We strongly advise you to book in advance with your tour operator to secure your place. 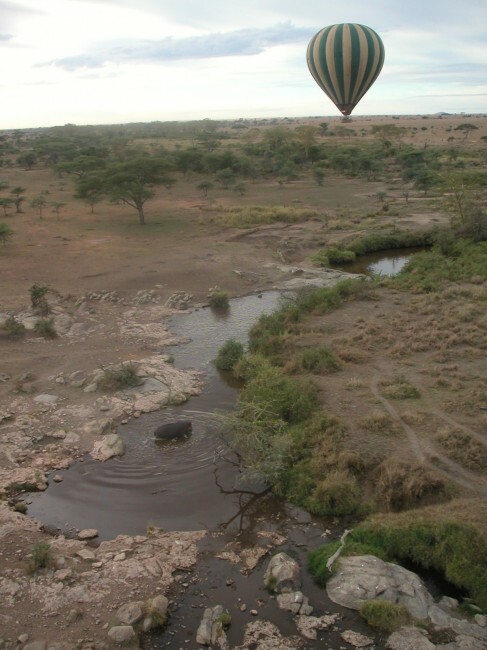 There are only two balloons in the entire Serengeti and this exclusive adventure is frequently fully booked. When is the best time of year for ballooning in Serengeti? Conditions are generally favourable year round in Serengeti and we fly throughout the year depending on weather. Check the Balloons Safaris News & Update page. When is the best time of year for game viewing? The Seronera River Valley (our flying area) has excellent resident wildlife populations throughout the year, eg, lion, leopard, hippo, buffalo, giraffe, various antelope etc. The wildebeest migration is dependent on the rains for grazing. The great herds USUALLY pass through the Seronera Valley late May / early June heading west & north with their new calves. They return again USUALLY late October / early November en route to the short grass plains in the south & east. Check the Balloons Safaris News & Update page. What about the ‘rainy seasons’? We prefer to call these the GREEN SEASONS. The ‘long rains’ (late March to early June) & the ‘short rains’ (November to mid December). The great migration passes through the central Serengeti during the green seasons. At these times it USUALLY rains late afternoon and during the night. The mornings are USUALLY bright and clear with gentle winds (great ballooning weather!). The landscape is lush and green and dust free (yes, your vehicle may get stuck in the mud – but our balloon won’t!). We do not carry children under the age of 7. There is no upper limit, however passengers must be reasonably mobile, fit to fly and prepared for an adventure. Balloon passenger weights are calculated at an average of 80kgs. Passengers weighing 50% + more than this (i.e. 120kgs / 265lbs /19 stone) may be charged for two places. Visit the trips page for professional, inexpensive expeditions to Kilimanjaro! All routes as well as affordable safari, everything customized for group prices!